During the closing months of Nero’s (54-68AD) reign saw uprisings against his tyrannical rule in Gaul, Spain, and North Africa. 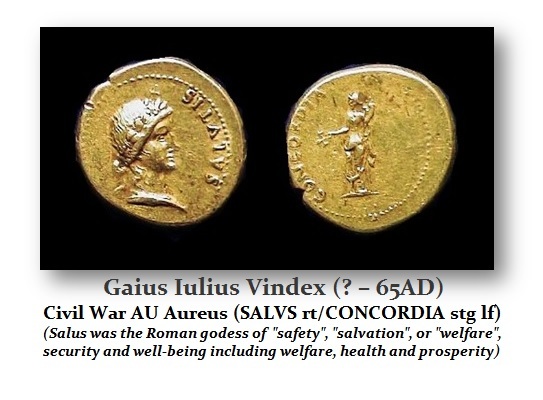 Gaius Julius Vindex was governor in Gallia Lugdunensis, which is now the central region in the modern country of France. Vindex was of a noble Gaulish family of Aquitania and was given senatorial status under Claudius. In either late 67 or early 68AD, Vindex rebelled against the tax policy of the Emperor Nero (54-68AD). According to the historian Cassius Dio, Vindex “was powerful in body and of shrewd intelligence, was skilled in warfare and full of daring for any great enterprise; and he had a passionate love of freedom and a vast ambition” (Cassius Dio, 63.22.1-2). Vindex was the first of these commanders to rise up against the unpopular Nero and his tax policies in March 68AD. Vindex had appealled for military assistance, which was answered the following month by Servius Sulpicius Galba, who was the governor of Hispania Tarraconensis (modern Spain). In order to gain support, he declared his allegiance to the then governor of Hispania Tarraconensis, Servius Sulpicius Galba, as the new emperor. Vindex was defeated and killed by the commander of the Germania Superior army, Lucius Verginius Rufus, in a battle near Vesontio (modern Besançon). By June 68, military support for Galba led to Nero committing suicide. Galba, acclaimed by the Senate, struck coins to commemorate Vindex, to whom he owed his position as emperor. Vindex issued anonymous aurei and denarii, probably at Vienne, until his revolt was crushed by Verginius Rufus, governor of Upper Germany, in May of 68AD. Galba was now committed to the cause, and Nero’s suicide in June and the Senate’s subsequent acceptance of his rule left Galba as the successor to the now extinct Julio-Claudian dynasty. While Galba was in revolt in Spain he also issued anonymous aurei and denarii as well as some with his portrait and the title Imperator. This aureus was issued at Tarraco in the period April-June AD 68 and bears the head of the Empire’s founder as the deified Augustus. At this time of civil war, the type looks back to the stability of the Augustan age and forward to its restoration under a new regime. The personification of Hispania on the reverse honors the province from which Galba’s bid for the throne was being launched. The troops of Spain declared him Imperator and the Senate of Rome declared in his favor. As Galba began to march toward Rome, Nero attempted to flee but with no escape possible, he committed suicide. However, when Galba was summoned by the Senate to accept the “Purple,” he was already at a very advanced age of 71. Born to a royal family among one of the Gallic peoples of Aquitania, Vindex was a Roman citizen, senator, and possibly praetor before becoming governor. Coins minted during his rule confirm his allegiance to the traditional ideals of the Roman ruling class. According to the historian Dio Cassius, Vindex inveighed against Nero and swore to act in the interest of the Roman Senate and people and to foster a return to the Augustan model of empire. Some modern scholars, however, have regarded Vindex’ rebellion as a move toward Gallic independence. In any event, discontent was rife in the empire and he won the support of Galba, a governor in Spain. Vindex committed suicide after vainly trying to resist the Roman armies of the Rhine under the command of Verginius Rufus.